For over two decades, backpacking has become a passion. I am a four-season backpacker and an off-trail navigator. Although I do take yearly trips to the American West or Southwest, the majority of my trips are in Michigan and Canada. My pack weight varies considerably but my base weight is below 18 lb (8 kg). I am primarily a tarp camper who averages more than 50 nights a year backpacking in a huge variety of weather conditions including relentless rain, wet snow and sub-zero temps. 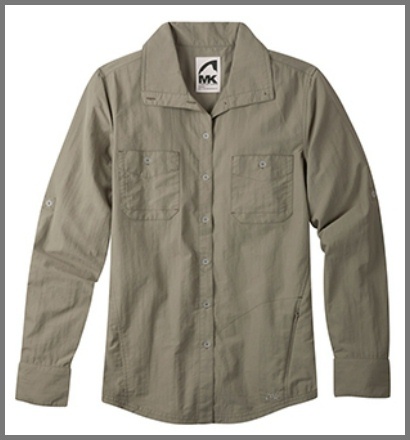 The Mountain Khakis Granite Creek Long Sleeve Shirt arrived in the requested color and size. I ordered a size large based on the website's chart. Although the shirt technically fit it was a much closer fit than I desired for backpacking. The fit would be more like something I would wear when I am not active. I contacted customer service and they responded promptly. The replacement shirt has already arrived within a week of contact (amazing service). The new shirt fits more loose and will seemingly be more comfortable to wear. The underarm sleeve length is a full 20.5 in (52 cm). The Granite Creek Shirt comes in Men's and Women's sizes as well as several colors. There are also short and long sleeve versions. Although I would classify the Granite Creek Shirt as having many features like many other long-sleeve hiking shirts there is a distinguishable difference in that the collar on the shirt is oversized. 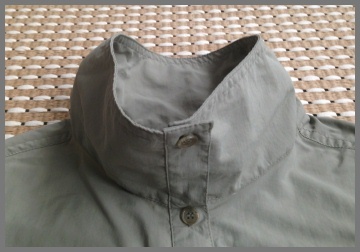 The collar width is approximately 3.25 in (8.26 cm) and can be fastened with a single button to stand up. This likely would help protect my neck from both sun, wind and bugs. It also is very attractive worn that way. The Granite Creek Shirt is fabricated with a very soft fabric called Taslan. The manufacturer reports that it is soft next to skin yet abrasion resistant. It does feel velvety and will be nice to wear. The nylon material is reportedly quick drying. The shirt is also DWR (durable water resistant). That will be an interesting feature in light rain as normally I would grab my raincoat to protect my shirt from wetting out. The shirt is rated with UVA-UVB 50+ resistance for sun protection. It also has a UPF (ultraviolet protection factor) rating of 45. This means that the fabric will only allow one-forty-fifth of sun rays to penetrate through the fabric. The Granite Creek Women's shirt has some feminine touches such as princess seams. The lower back of the shirt is sewn with four pieces. The center seam is pressed flat and stitched on both sides of the seam while the other seams are pressed to one side and single stitched. The back is also shaped with a yoke section. The front of the shirt features a center button placket and two chest pockets with button closures while there is also a lower right mesh-lined pocket that opens and closes with an invisible zipper. 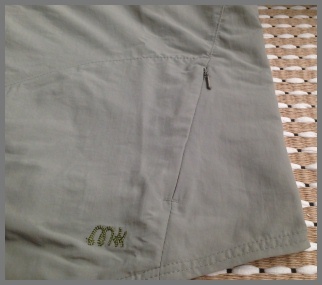 An embroidered logo (MK) using chain stitching is located on the right lower side. 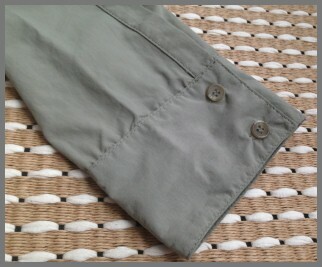 Sleeves end with a button cuff (two buttons on each) but also feature a roll-up option that can be secured with a button located higher up on each sleeve. The manufacturer suggests washing it in cold water with no bleach or dry cleaning. It can be tumble dried and a cool iron can be used on it. I look forward to many months of testing the Granite Creek Shirt during various backpacking trips plus day outings. During the field test period I have worn the Mountain Khakis Granite Creek Shirt during two backpacking trips for a total of nine nights/ten days. It has also been worn for about two dozen day hikes as well as a fishing adventure (two days). 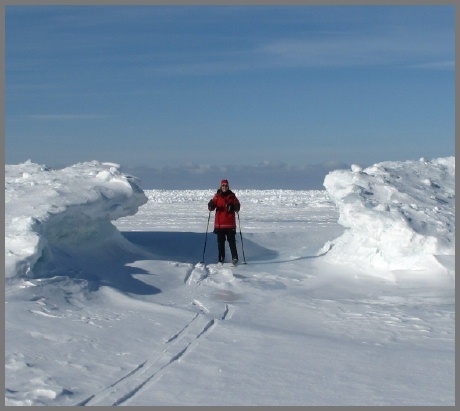 Locations of all activities were in the state of Michigan and ranged from lakeshore to boreal forest. Elevation ranged from above 600 ft (183 m) to almost 2000 ft (612 m). The Granite Creek Shirt was initially worn for a couple of dayhikes before heading out on a eight-day backpacking trip. Spring temperatures were very cool so I layered the shirt with a light stretch vest or a light wool tee shirt and sometimes a light jacket. I soon became warm so I removed the layer(s). 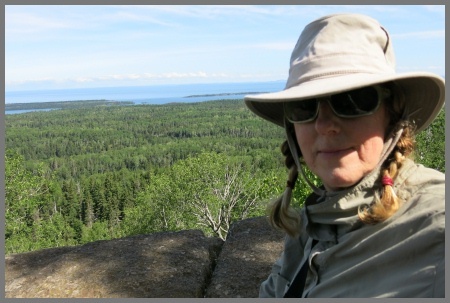 When I headed out to Isle Royale National Park for the first backpack trip, the temps remained cold as the island is surrounded by Lake Superior which was still only at 38 F (3 C). With the wind chill the temps (50 to 60 F/10 to 16 C) were very chilly. 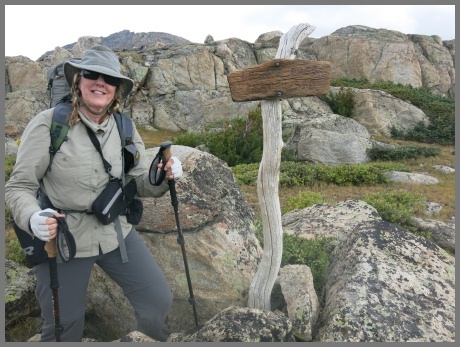 I sometimes started out wearing the shirt with a light wool short sleeve shirt underneath but usually by the time I was on the trail for only a short period, I removed it. The shirt kept me very comfortable with some wetting out on the back portion where my pack sits. As soon as I would take my pack off for a break it would start to dry out. When I reached camp each day I would take the shirt off and layer on other clothing included an insulated jacket as it was quite cool most days. I would air the shirt out for the night and put it back on in the morning. I only rinsed out the shirt twice on this trip when I had some hours of sunshine in the afternoon to dry it out. It dried quicker than I thought it would in cool weather with moderate humidity, probably 60-70 percent. It took about an hour to dry after being completely wet. Although the temps did reach 80 F (27 C) on one day of my trip I was already done hiking for the day so I didn't get to experience wearing it while carrying a pack in very hot weather. However those types of temperatures are probably not going to happen here as summer is waning. 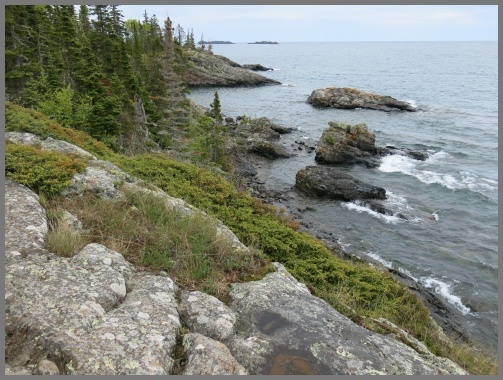 My second backpacking trip was to a nearby island in Lake Superior - Grand Island. It was still cool weather although it was the middle of summer. I felt very comfortable in the shirt while backpacking around the island. It was terribly buggy on most stretches of the trail but I didn't feel any mosquitoes (the main culprit, although there were also flies and more) penetrating the fabric. 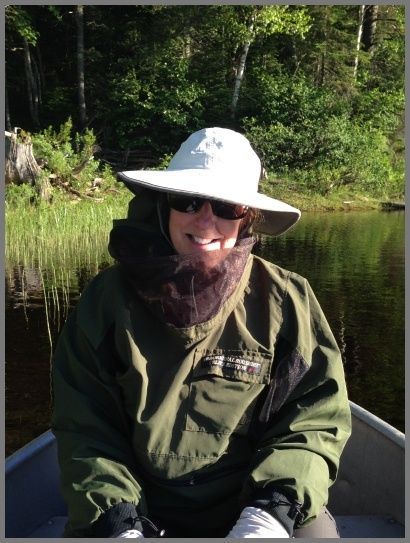 I didn't wear a headnet but did wear a sun hat that I had sprayed with bug protection. Between the high collar on the shirt and the spray scent, the bugs didn't have a chance at me. The soft fabric has been so comfortable against my skin. This has been so noticeable as many similar style shirts that I own do not feel as good on my body. I have only used the zippered pocket when I am dayhiking. Although I can fit my phone in the pocket it is a tight fit because of the rubber cover around my phone. Keys are easier to store in it as an alternative. On my two-day Grand Island trip I decided to forgo my camera and bring my phone to use for pictures. I used one of the chest pockets to hold the phone for quick access. It stayed in place so it worked out fine. So far, I haven't had any issues with the shirt. I quickly wiped off any food drips as soon as they occurred with no staining. It has washed beautifully after every trip. It probably has been washed upwards of two dozen times as when I wear it for a day hike it goes in the laundry afterwards. It probably wasn't necessary however as the shirt held no detectable odor or dirt. The Truffle color of the shirt works really well in the outdoors for blending in with nature as well as hiding any possible dirt. There are no signs of wear on the shirt. Looking forward to the next two months of testing. 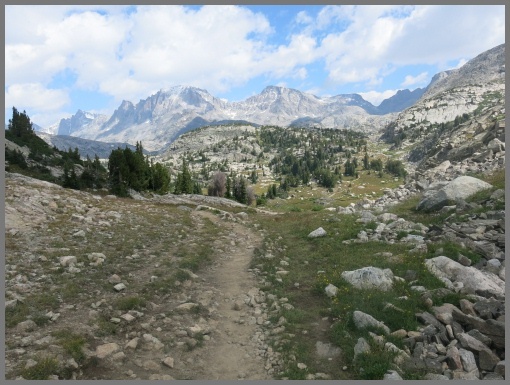 I will be heading to Wyoming to the Wind River Range so it will be interesting to see how it performs in a different environment. During the long term test period I have worn the Mountain Khakis Granite Creek Shirt during 14 days of backpacking, and numerous day hikes. 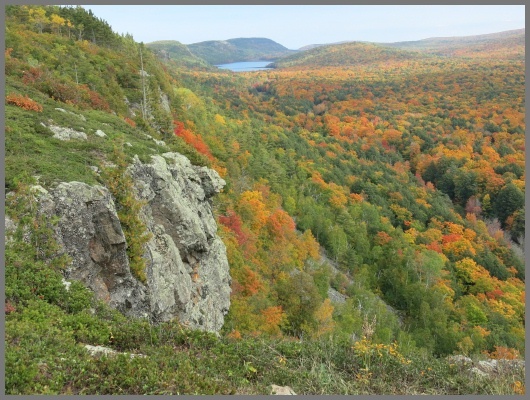 Locations of most activities were in the states of Michigan and Wyoming and ranged from lakeshore to boreal forest to mountainous terrain. Elevation ranged from above 600 ft (183 m) to 11,560 ft (3523 m). Pack Weight: 25 lb (11.34 kg) luxury backpacking - brought camp chair and hammock and tarptent! During the long term period I wore the Granite Creek Shirt during many backpacking trips. For the most part the weather was on the warm-to-cool side during the day (60-75 F/16-24 C) but much cooler when I started hiking in the morning. Sometimes I would start out with a light stretch vest over the shirt or a light wool tee under the shirt. This was usually quickly removed as I got too hot. During my last trip the temperatures were consistently in the mid 70's (24 C). Although the shirt was comfortable my back would always be soaking wet when I took off my pack. Even though the shirt dried quickly enough if I was in sun, I still didn't particularly like the clammy feeling in the meantime. Of course, when I just wore the shirt with a simple belt pack (during dayhikes) I didn't have this problem and was more comfortable. I really love a lot of attributes of this shirt including the high collar and nice fit but I wish it had some venting in the side seams or armholes. A mesh insert or two would do wonders I think. As far as the best attributes, I love the length of both the shirt and sleeves. There was always adequate coverage when I bent over or moved my arms. The tall collar was a unique feature which I much appreciated. I almost always kept it buttoned so that it would give more sun coverage plus it was nice when it was windy as well. The fabric was also very comfortable being very soft. The Granite Creek Shirt has been easy to care for both in the field and at home. Since most of my trips featured rather cool weather I just simply aired the shirt out after arriving at camp as I wanted to put on something warmer. The shirt hasn't held any detectable odor after wearing it many days in a row. At home I have washed it with my regular laundry and placed it on a drying rack with good results. The shirt remains stain free as well as having no piling where straps and belts might have rubbed it. All stitching and buttons are intact. The shirt has been worn for twenty-four days of backpacking as well as at least twenty days of dayhiking with great results. Overall I will certainly continue to wear the shirt during many outings. It won't get any winter use but come spring it will be the first shirt out of the closet. Thanks to Mountain Khakis and BackpackGearTest for this opportunity to test the Granite Creek Shirt. This concludes my Long Term Report and the test series.